The Ardennes 2015: A weekend out with the boys. Some of the guys picked me up at work. One of my colleges was sending us off. At the port in Rødby where another guy joined us. In good company at Baton Rouge. Ready for the ride Saturday. We were not the only ones enjoying the roads. 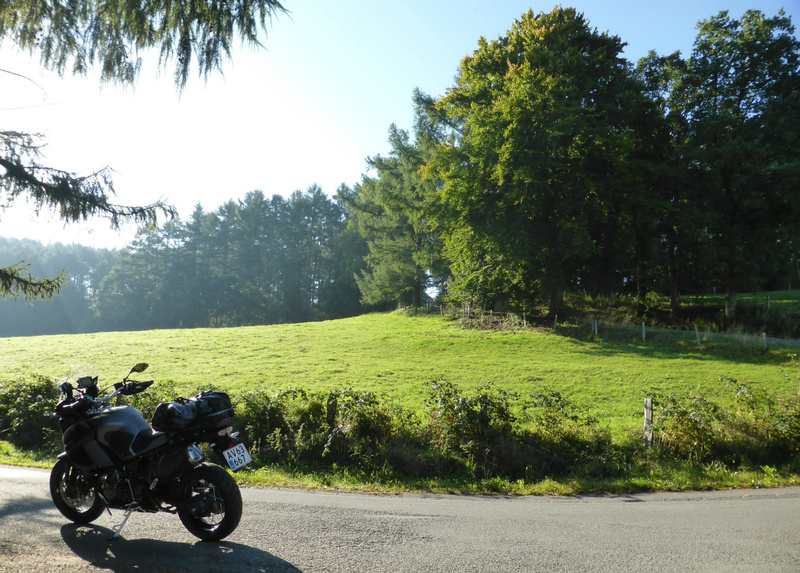 Leaving the Ardennes on a beautiful morning. One of only two stops on the +700 km ride between Baton Rouge and Puttgarden. 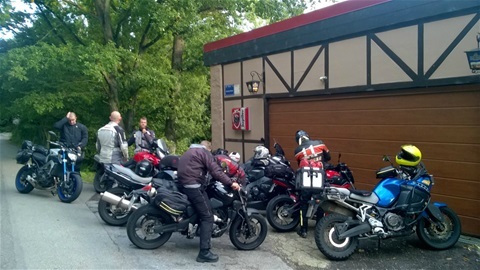 In March I contacted 10 of my friends - inviting them participate in an extended weekend ride to the Ardennes in September. The reason for the early notice was that most of my friends live busy life's with many obligations. Honestly I didn't expect many of them to sign up but I was pleasantly surprised. Within a few days I got 9 positive responses. Only one guy found that a ride like that was more than he could stomach - he rides a KTM 690 Enduro. In the weeks up to the trip I received 2 cancellations - one guy had gotten a new job at the Danish embassy in Kabul and would be leaving before the trip - another got his bike stolen and wouldn't have time to work things out with the insurance company before departure. Departure was set for Thursday morning the 24th of September when I got off from work. 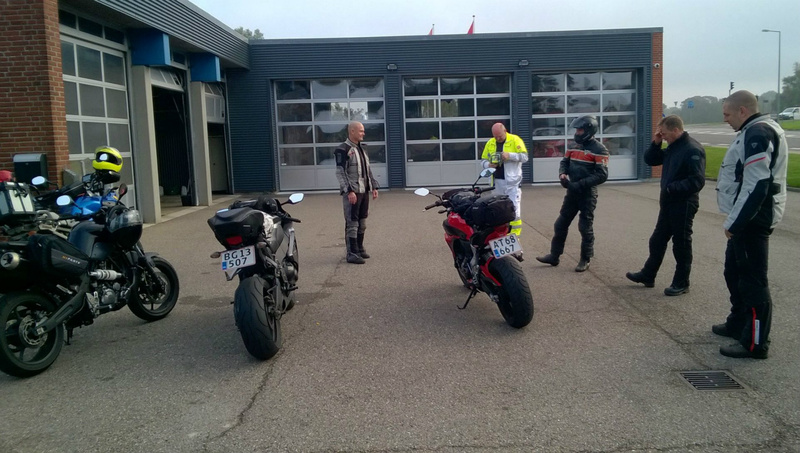 4 guys showed up at my work and together we headed for the port in Rødby where we met up with the last guy leaving from Zealand. After a 45 minutes ferry crossing we arrived in Germany and hit the Autobahn towards Hamburg to meet up with the last 2 guys. They came from Jutland and showed up as planned. The gang was now complete and we continued south east on smaller roads. 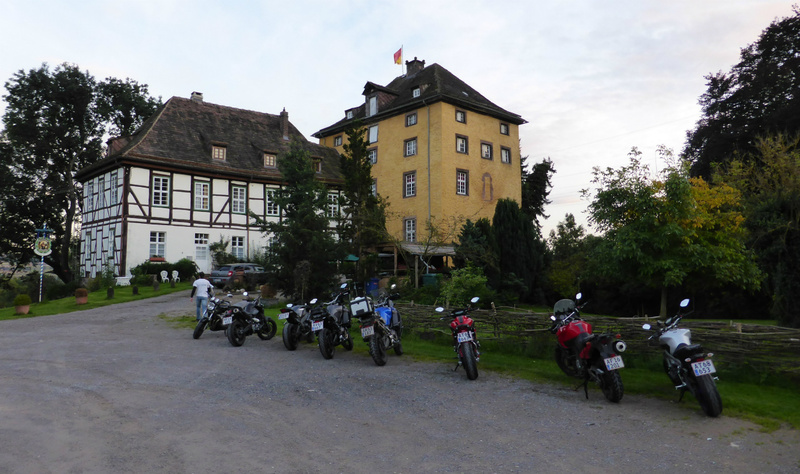 Late in the afternoon we arrived at Tonenburg - a 14 century castle where I had booked accommodation in advance. 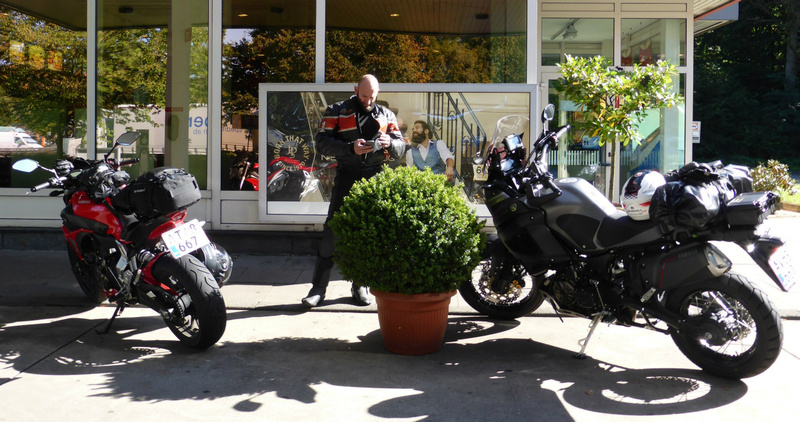 Tonenburg is known as a biker friendly place and turned out to be just that. The rooms were simple but nice, the food plenty and there was a good selection of beers. 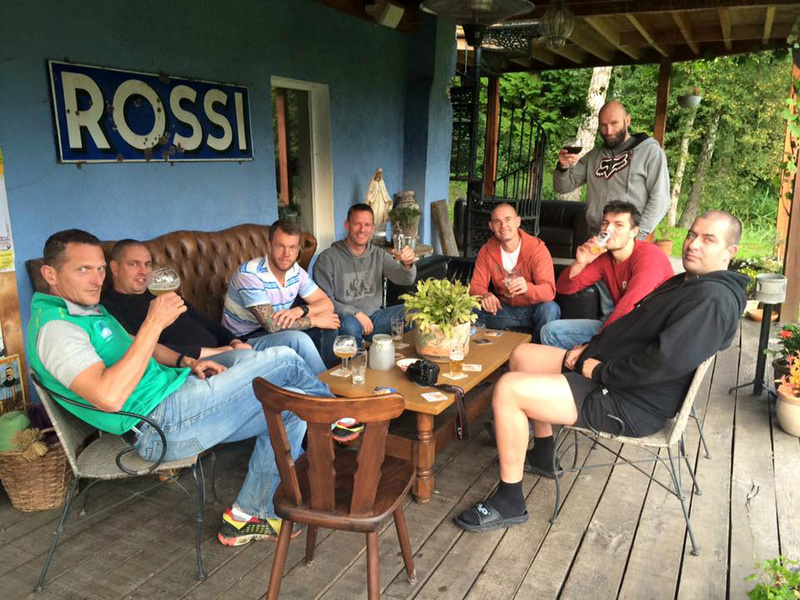 Some of the guys hadn't met prior to this trip. I like to bring friends from different circles together and have done so several times before. It seemed like everybody enjoyed the company and conversation flowed easily both between old friends and new acquaintances. It was a nice evening. Friday morning we were back on the road early after a good breakfast. We spend the day riding some of the good roads Germany has to offer instead of wasting time on the Autobahn. After a good long day’s ride we arrived at Baton Rouge in Belgium. One of the guys - Johs - arrived in a cloud of oil scented smoke. It turn out that the reason was a leak in the oil cooler on his 16 years old Suzuki Bandit. Baton Rouge is a Motorcycle Inn run and owned by the Dutch couple Ben and Hetty. It would be our base for the weekend. We were accommodated in an 8 bed dorm up under the roof. After a change of clothes and a couple of cold beers on the porch it was time for dinner. As always at Baton Rouge the food was really good. Hetty is a brilliant chef. After dinner Ben was put to work behind the bar as several of my friends put in a valiant effort to drain the place for draft beer. We were having a good time. 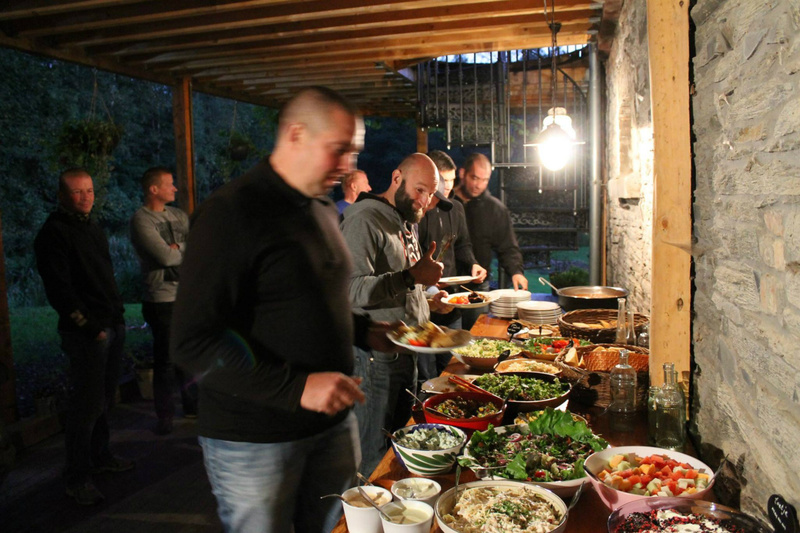 Surprisingly enough everyone seemed fit for fight when they showed up for breakfast the following morning. 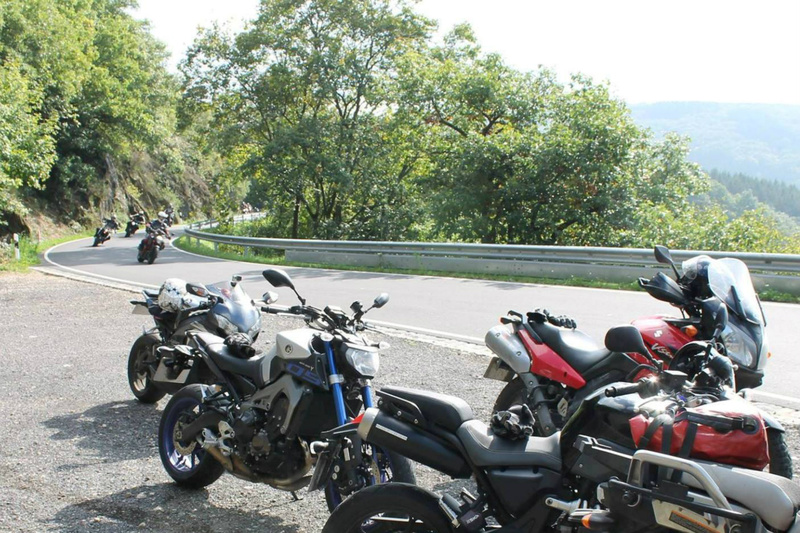 The plan for the day was that Ben would take out his Speedtriple and show us some of the great roads in the area. There is nothing like having a local who knows how to ride leading the way on new roads. But before the fun could begin we had a leaking Bandit to attend to. Ben took us to the local motorcycle shop. Not much help there. Ben then decided to stay with Johs and figure out another way to get the Bandit fixed. Sadly this meant that we lost our guide and the gang was a member short. Now the 6 P's came into play (Proper Preparation Prevents Piss Poor Performance). In the morning Hetty had provided me with a +200 km route just in case something like this should happen. The remaining 7 of us took off with me as a guide. The route was fantastic. It took us through beautiful landscapes and picturesque towns on exciting motorcycle roads in 3 countries (Belgium, Germany and Luxembourg). We arrived back at Baton Rouge several hours later in high spirit. I shot some video during the ride. While we had been out riding Ben had found a guy who could fix/replace the oil cooler on the Bandit. Johs was sad that he had missed the ride but relieved that his bike was back in working order. Saturday night is BBQ night at Baton Rouge. I'm sure that everyone enjoyed the meal - even my friend Rene who managed to get in bad standing with Hetty because he tried to avoid the delicious side dishes she had prepared and gorged only on the meat. She named him The Meat Eater. After dinner the attack on the bar was less vicious than the night before. People took it easy because they had in mind the long ride home the next day. It was still a joyous evening. Sunday morning people were up early. In advance we had agreed that we wouldn't do the ride home as one group. Some was in a hurry to get home others wasn't. The most anxious one to get home left before breakfast was served. After a quick breakfast 4 other guys hit the road. 1 guy who had decided that he wanted to spend 2 days on the ride home took off next. Rene (The Meat Eater) and I was the last ones to leave Baton Rouge. 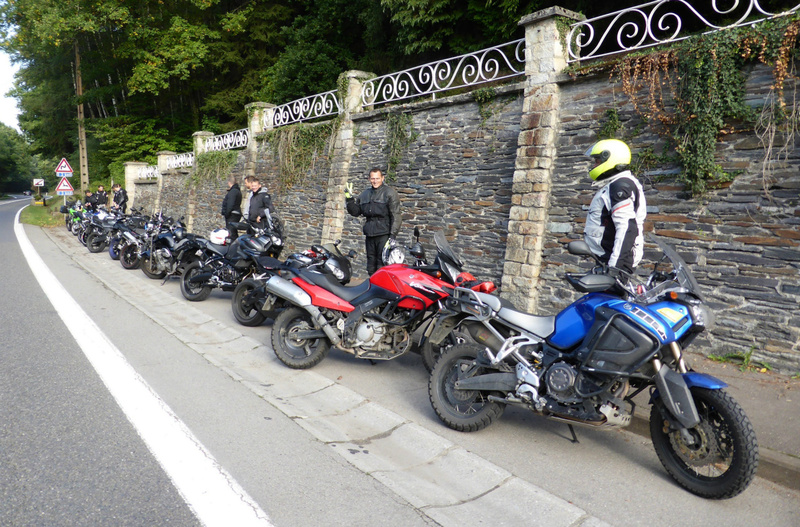 We started out on beautiful small roads through the Ardennes. As we neared the border to Germany we hit the highway. From then on and until we arrived at the ferry in Puttgarden we only stopped twice to stretch our legs, get a snack and fill up the bikes. I arrived home just in time for dinner after a nice but uneventful +800 km day in the saddle. Besides having a great time with good friends the weekend also gave me an opportunity to try out the touring potential of the brand new XT1200Z I had acquired only a few weeks before the trip. It impressed me in every way. It was very comfortable and handled everything from highway to small twisty roads extremely well. I'm really looking forward to our future adventures together.